A man who violently attacked two police officers sent to check if he was alright has been jailed for 32 weeks. 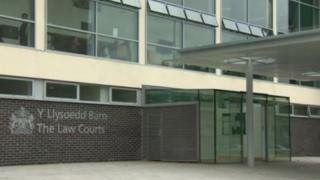 Craig Downward, 41, of Wrexham, had drunkenly argued with his partner and went to sleep in his van outside his home on 4 July. Mold Crown Court heard she called police and an officer was kicked while another was pinned down by Downward. He admitted two assault charges, putting him in breach of a suspended sentence for attacking a teenager. The court heard how officers were patient and polite, but Downward attacked them. He pressed one officer against the floor and repeatedly kicked his colleague on the legs and hip as she went to help. "All they did was to tell you they would take you home. You were immediately aggressive and confrontational," said Judge Niclas Parry. He described Downward as being "completely out of control". The judge said Downward had a "bad record for violence" and took into consideration a suspended sentence for breaking the nose of a teenager. Defence barrister Nicholas Cockrell said Downward thought he was "doing the right thing" by leaving the house to sleep in his car after the argument.